In honor of the 68th anniversary of the founding of the State of Israel, a diamond featuring a distinctive Star of David diamond ‘cloud’ is to go on display at the Harry Oppenheimer Diamond Museum in Israel’s diamond district Ramat Gan. 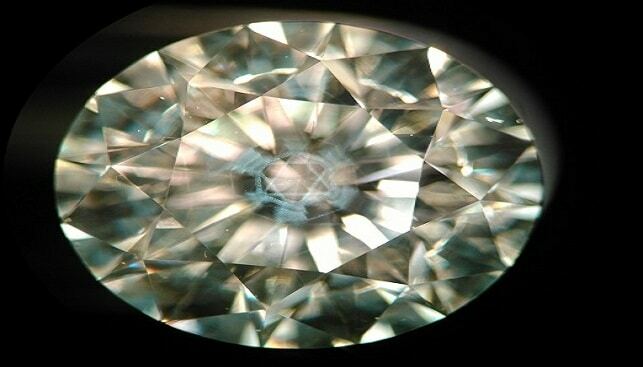 A cloud is used to describe internal inclusions that often appear in a diamond. These defects sometimes appear as a milky white shade and create a smokescreen in the diamond, which looks similar to a cloud in the sky. A cloud harms transparency and clarity of the part of the diamond where it is located, thus impairing the clarity of the diamond, and causing a reduction in its value. In this particular diamond, the cloud formed a shape of two inverted equilateral triangles, which created a distinct Star of David shape. The diamond, which weighed 4.60 carats in its rough form, weighed 1.67 carats at the end of the polishing process. The diamond has been examined by the Gemological Institute of America (GIA). On the gemological certificate, under the Additional information section, the certificate states STAR OF DAVID.